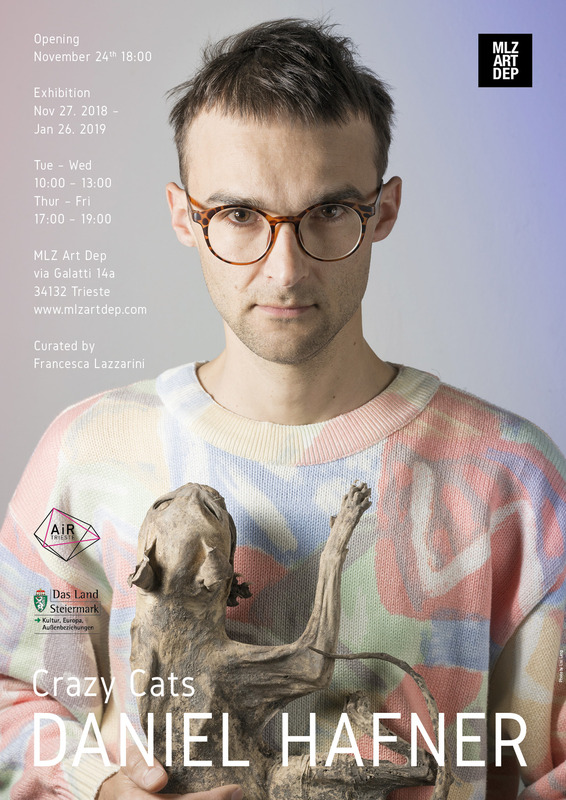 Crazy Cats, the solo exhibition of Austrian artist Daniel Hafner curated by Francesca Lazzarini, opens on Saturday November 24 at 6:00 pm at the MLZ Art Dep gallery in Trieste. Conceived as a perceptive macro device, Crazy Cats is a mosaic composed of diverse elements: objects found by the artist in Trieste and its surroundings, QR codes that refer to the geolocation of such findings, fluo-toned gradients created directly on the gallery walls and digital paintings whose reflecting surfaces connect all the existing elements together, integrating them into the architecture of the exhibition space. Although showing a continuity with Hafner’s previous research – the artist often intervenes on space creating fictional narrations that alter its perception – the exhibition stems from the artist-in-residence experience within the Air Trieste program, carried out with the support of Das Land Steiermark’s Cultural Department. compels the viewer to continuously reposition themselves putting their point of view to the test whilst trying to assess the very nature of what is being observed. Daniel Hafner (Deutschlandsberg, Austria, 1979) lives and works in Vienna. His artistic practice includes various creative fields, ranging from visual art to performance and sound art. He studied at the Academy of Fine Arts, Vienna, where he participated in the digital media and art in public space departments. Throughout Hafner’s artistic practice, is the investigation of site-specific and life-science themes – luring participants into a subtle reflection on the variable possibilities of reality. Selected solo and group exhibitions include: ACF Bratislava, SK; Kunsthalle Košice, SK; Frederick Kiesler Foundation, Vienna, AT; Projektraum Viktor Bucher, AT; Kunsthaus Graz, AT; Akbank Artcenter Istanbul, TK.